While I was attempting to read War of the Worlds by H.G. 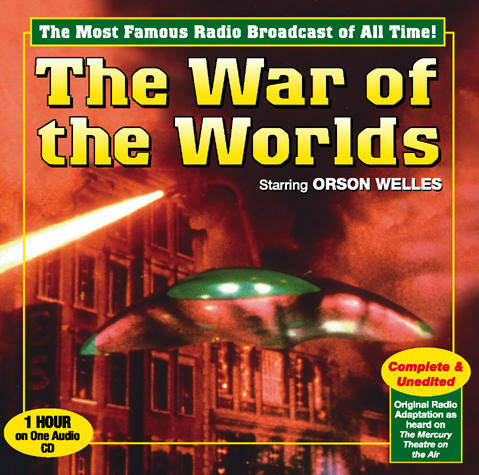 Wells for Classic Book Group, I came across this War of the Worlds 1938 Edition of the Radio Play featuring Orson Welles. I decided listening to it was my best shot at making any progress with this book. So I bought this illustrated edition of War of the Worlds for $5.00 on a bargain table that claimed on its cover "An excellent guide to all things War of the Worlds" but I was mostly interested in listening to the radio play which accompanied the book. So, I decided to listen to it while I was mopping my floor. Well, it could've been that I was so excited to make some sense out of the book or that I was delirious from mopping my floor but I was completely swept away for this single hour and entertained. First the Announcer and then you hear the great voice of Orson Welles: "We now know that in the early years of the twentieth century this world was being watched closely by intelligences greater than man's and yet as mortal as his own..." Then after this brief introduction, different radio announcer's come on and off keeping you up to date with the latest news, reports and interviews from around the country about the alien invasions and continues switching it up like that for the entire radio play. A couple of times my children asked me what I was listening to and if it was real, which I thought was amusing, but that's what caught me thinking of how some people in 1938 could consider that this might be real. It is most likely true that there was not as much paranoia as reported but there was enough that they had to have press conferences the very next day about the impact the radio play had on the general public at that time. After all, it was aired on the eve of Halloween and it does have a creepy vibe to it. Orson Welles, himself said "We expected a lunatic fringe, but we didn't know it would go all across the country." For me, it was an eventful way to spend an hour and sure made my mopping job a little easier too. I would recommend to others to spend an hour of their time to listen to the radio play. I think it entertains better and faster than the book. I love those old radio shows. I grew up listening to Mystery Theatre on a local station. I'm going to try and find this one. I think my kids would like it too. I've never read the book but have always wanted to. Hey that's cool Lula! I've never heard a radio play before. This one sounds like a lot of fun.